I’m off to Orlando and IRA (the International Reading Association) tomorrow to be part of an all-day workshop with some wonderful scholars and teachers. The workshop, “Teaching Literacies with Digital and Pop Culture Media for Grades 4-12,” includes Margaret Hagood, Donna Alvermann, Barbara Guzzetti, and many others whose work I have admired for a while now but have never had the chance to work with. 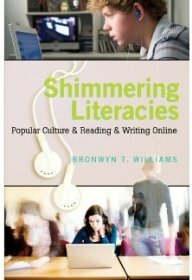 I’ll be talking about “Rethinking Reading and Writing with Participatory Popular Culture,” which continues the research from Shimmering Literacies. I’m focusing on how digital media are not only changing students conceptions of interpreting and composing texts, but blur the line between the practices of reading and writing in ways that have implications for how we teach reading and writing in a multimodal culture. So I am grateful to be included in this workshop and looking forward to the presentations and conversations. I plan to learn a lot. More to come next week, both about the workshop and end-of-semester reflections on the “New Media and Composition Pedagogy” seminar.